With the skin being one of the largest organs of the body, it`s no wonder how much emphasis is placed on caring for it. The skin is also the most visual of all organs and good skin care means a more beautiful, healthy person. The genetics, race, and age all play a factor in maintaining the skin type. How a skin reacts to the diet, hormones, the environment, and climate people live in can help to determine how to choose the best skin care products and also determines the most effective way treat the skin problems. Let us now see the five basic skin types, which you will find easier to make and use your own Aromatherapy beauty products. Normal skin feels comfortable and requires the least attention. Normal skin is soft, supple and smooth. It is fine-textured and free of blemishes. Normal skin has a nice glow and never feels oily or dry. Those lucky enough with this skin type have a proper balance of moisture and oil production to have smooth, healthy skin with minimum breakouts since the normal skin produces a healthy amount of sebum, and tends to be neither dry nor oily in feel. Cleansing with a mild soap every day and using a light moisturizer if needed is usually enough for this low-maintenance skin type. Dry skin can affect any age group but it`s more common as a person gets older. This skin has a fine texture and is transparent looking. It feels tight and drawn without moisturizer and tends to have fine lines around the eyes and mouth. Dry skin is uncomfortable and tight, but it feels drier after washing and may have whiteheads around the eyes and dry patches. Dry skin usually results when skin fails to produce enough sebum to maintain a naturally lubricated surface. This means the loss of oil from the outer surface of the epidermis and the insufficient replacement from the tissues that are below. Some causes of moisture loss are due to the usage of soaps, which are frequently and constantly exposed to dry air. Anyone who spends a lot of time in air conditioning is likely to suffer from dry skin. Because of the lack of oil, dry skin is prone to fine lines and wrinkles appearing. This lack of oil in the skin is often hereditary, but can also be caused by over-exposure to the sun and other environmental elements. As a person ages, the skin becomes drier as decreased metabolism reduces the rapidity with which dead skin cells are replaced. Dry skin often appears coarse, tight, dull and flaky, with visible lines and wrinkles. If your skin is dry, use a moisturizer often, underneath makeup and before bedtime to increase the comfort level and reduce your chances of unwanted lines. You can also massage with essential and cold pressed oils can stimulate metabolism and alleviate dry skin conditions. Oily skin has a greasy, sallow and course complexion. Shininess, pimples and blemishes characterize oily skin. Oily skin also has large pores and tends to have pimples, blackheads and whiteheads. After washing the face, within a few hours, the oiliness reappears and makeup is usually absorbed quickly. Oily skin is caused by over-active glands, which produce a substance called Asebum, a naturally healthy skin lubricant. When these sebaceous glands work overtime and provide too much oil, they give the skin a shiny and sometimes greasy appearance. When the skin produces too much sebum, it becomes thick and heavy in texture. Large pores often are a characteristic of those with an oily skin type and this is the reason why teenagers frequently experience pimples and acne. 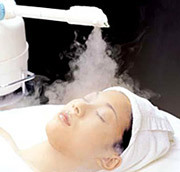 Frequent steam cleaning and exfoliation can help reduce these problems. Fortunately, there are many products on the market today to keep the oil in check; thus reducing or eliminating any scarring that may occur. Use of makeup and powder soaks up excessive oil while minimizing shine. Many people have different skin types on different parts of the face. For example, it is not uncommon for a person to have oily skin around the nose, forehead and chin, these areas are known as the T-zone while the rest of the face is more on the dry side mostly, the outer sides of the cheeks. Such is known as a combination skin and thus it is the trickiest to care since, some areas are dry, some oily and some may be perfectly normal. The T-zone requires a separate cleaning routine from the rest of the face. If you have more than one skin type on your face, it is wise to use products containing different ingredients to treat the areas differently. Use of hair care products that come into contact with the skin around the hairline can cause an unwanted drying affect. There`s no one product that magically solves problems for each individual area so it`s best to take the time to treat such skin types accordingly. Sensitive skin reacts unfavorably to a variety of chemicals and environmental factors. All skins are delicate and sensitive when it is new. However, increased exposure to nature`s elements such as the sun, wind and cold, as well as to harsh cosmetic ingredients, tend to toughen skin over time.